For several weeks I have had an ongoing project to photograph a pelican just skimming over the water's surface. I have not yet been successful in making that image, however in that pursuit I was able to make this in-flight shot of a brown pelican. I chose tin type processing for this image because a few weeks ago I went to an antiques fair and had a chance to browse some true tin type prints and was fascinated about how vivid some of them remained even though they were printed over a 100 years ago. I hope to be able to provide a shot of a pelican skimming over the water soon! In the meantime, it is always fun for me to photograph birds in any manner. 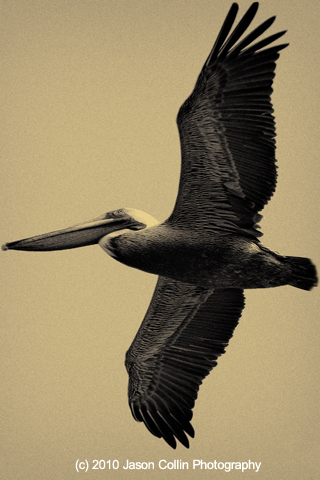 A high resolution print of Tin Type Pelican in Flight can be purchased here.